History, hospitality, and OMG THE QUEEN. In 1918, Woodrow Wilson became the first sitting president to visit Buckingham Palace. From left: Edith Bolling Wilson, Queen Mary, Woodrow Wilson, King George V, and Princess Mary. Wilson is cheered on by crowds of Londoners during a parade in Central London. 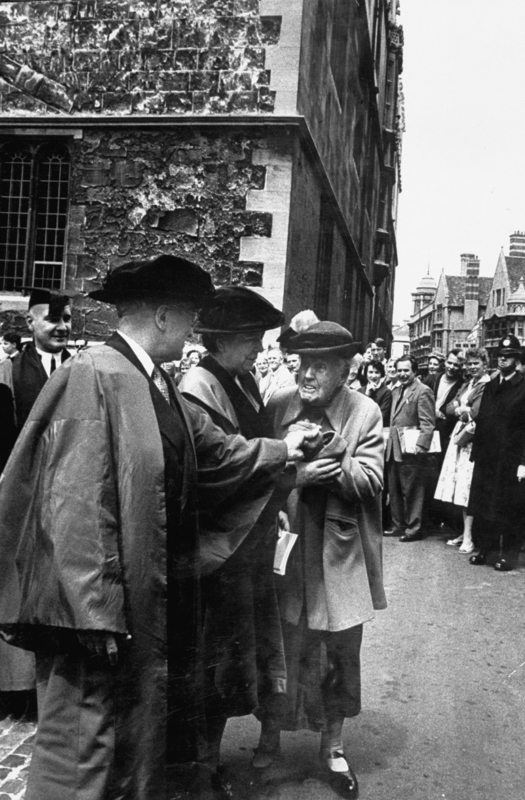 President Harry Truman being congratulated at Oxford University after receiving an honorary degree. President Eisenhower (centre) with the royal family in 1959. From left: Prince Philip, Princess Anne, Dwight Eisenhower, Queen Elizabeth, Prince Charles, and Captain John Eisenhower, at Balmoral Castle, Scotland, September 1959. Eisenhower delivers a speech to a large crowd from the balcony of Mansion House, London, on 12 June 1945. 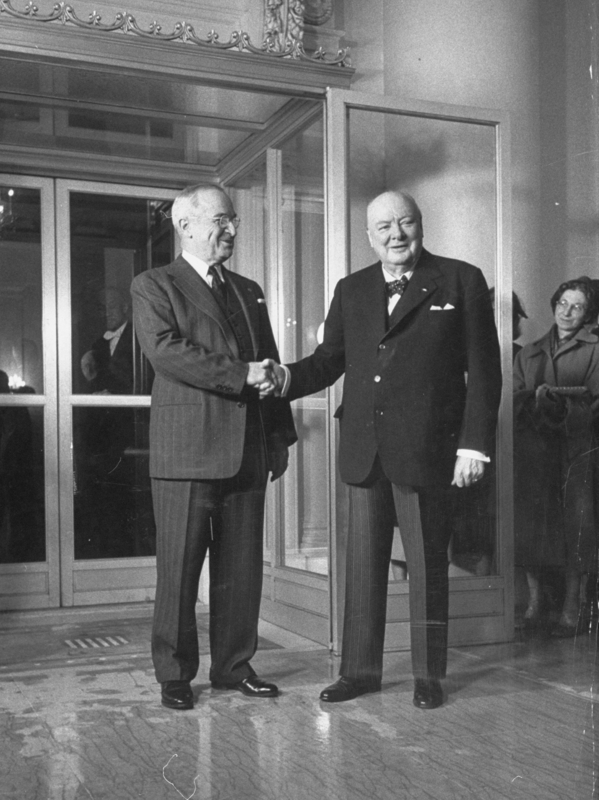 Eisenhower joins other politicians at a dinner party at Winfield House in London on 1 Sept 1959. Back row, from left: Field Marshal Montgomery, John Hay Whitney, Viscount Portal, Lord Tedder, Sir Brian Horrocks, and Lord Ismay. Front row, from left: Viscount Alanbrooke, Sir Winston Churchill, General Eisenhower, Lord Alexander, and Harold Macmillan. President John F. Kennedy and his wife Jacqueline Kennedy leave Admiralty House in London after meeting with prime minister Harold Macmillan on June 6 1961. Prince Philip, Jacqueline Kennedy, Queen Elizabeth, and president John F. Kennedy have a chat after dinner at Buckingham Palace. From left: prime minister Edward Heath, the Queen, president Nixon, and first lady Pat Nixon during a visit at Chequers, 1970. Queen Elizabeth II and Nixon walk through the corridors of Buckingham Palace, accompanied by the Duke of Edinburgh and Prince of Wales. The Queen and president Jimmy Carter at a state dinner at Buckingham Palace on 7 May 1977 following the third-ever G7 summit. Margaret Thatcher and Ronald Reagan outside Number 10 during a state visit to London. The "special relationship" between the two countries was founded on the rapport between the two leaders. US president Bill Clinton's cavalcade is welcomed to Carson's statue at Stormont, Belfast, during his two-day visit in November 1995. Bill Clinton (second from left) and prime minister Tony Blair (right) with Northern Ireland's first minister David Trimble (left) and deputy first minister Seamus Mallon (third from left) on the steps of the Parliament Buildings, Stormont, Belfast. John and Norma Major lead president Bill Clinton and Hillary Clinton up the stairs of Number 10, past the pictures of previous occupants of the historic home of British prime ministers, on their way to an official dinner. The Queen meets (from left centre) Hillary, Bill, and Chelsea Clinton at Buckingham Palace. US president George Bush and the Duke of Edinburgh during an inspection of the guard of honour at Buckingham Palace. A traditional 41-gun salute marked the start of the historic state visit. Queen Elizabeth II and the Duke of Edinburgh stand alongside Bush and his wife Laura on the forecourt of Buckingham Palace in London at the start of the president's state visit to Britain. US president Barack Obama and Michelle Obama outside Downing Street in London where they were greeted by prime minister Gordon Brown and his wife Sara ahead of the G20 Summit in April 2009. The Obamas talk with Queen Elizabeth II and the Duke of Edinburgh at Buckingham Palace. Barack and Michelle Obama are greeted by David and Samantha Cameron outside Downing Street as the US president embarks on a three-day state visit to the UK in May 2011. Barack and Michelle Obama during the ceremonial welcome by Queen Elizabeth II and the Duke of Edinburgh in the garden of Buckingham Palace as part of their state visit to the UK and Ireland. Obama and Cameron play table tennis at Globe Academy in South London. Queen Elizabeth II and the Duke of Edinburgh pose with Barack and Michelle Obama in the Music Room of Buckingham Palace ahead of a state banquet. Donald Trump and first lady Melania Trump disembark Air Force One at London Stansted Airport on July 12, 2018, as he begins his first visit to the UK as president. Laura Gallant is a photo editor for BuzzFeed UK and is based in London. Contact Laura Gallant at Laura.Gallant@BuzzFeed.com.